, but over the years, people have experimented with many other fillings which are equally delicious. Here are some of the most popular types of kachoris with different fillings that you must try this monsoon. Pyaz ki Kachori is a traditional snack from Rajasthan. You would find these kachoris in every nook and corner of the cities across the state. 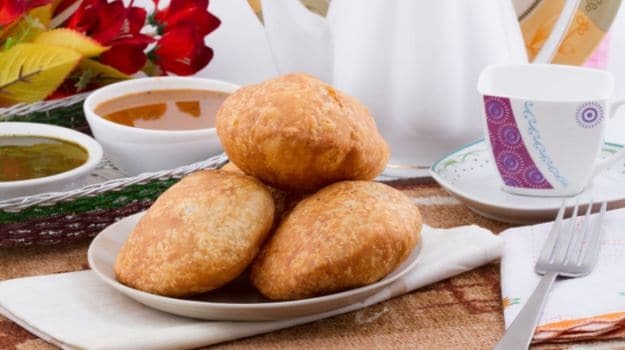 It is believed that the Pyaz ki Kachori was first made in Jodhpur and eventually became popular in other cities. This spicy kachori is filled with onions, kalonji, bay leaves, coriander leaves, garam masala, green chillies and fennel seeds and fried in ghee. This kachori tastes brilliant with saunth, a sweet and spicy tamarind chutney. Paneer ki kachori is popular in Uttar Pradesh. It is generally eaten for breakfast along with coriander chutney or aloo ki sabzi. It is filled with lots of paneer, asafoetida, chaat masala, coriander powder, garam masala and cumin seeds. It is also great with your evening cup of tea. Hara chana makes for a delicious filling in a kachori. The kachoris are usually made with wheat flour and stuffed with hara chana, ginger, coriander leaves, green chili and various spices. The filling becomes a little dry and therefore, people like to savour it with raita or spiced yogurt. Dry fruit Kachori or Mawa Kachori is a sweet version of the kachori. It is believed that the Mawa Kachori was invented by a halwai named Shri Rawatmal Ji Deora of Rawat Mishthan Bhandar in Jodhpur. It is made with dry fruits like cashew nuts, almonds, walnuts and pistachios and lots of khoya (mawa). It is fried in desi ghee and then dipped in sugar syrup. This one is a regional favourite from Gujarat and like all the other Gujarati delicacies it has a sweet and salty flavour. It is made with a spiced dough which is filled with peanuts, clove powder, cardamom powder and coconut and is fried till crisp. It is stuffed with sweet green peas mixed with spices. Matar ki Kachori is also known as ‘Vatana Ni Kachori’ in Gujarat. These are not as crisp but absolutely delicious. They should be paired with coriander chutney and tamarind chutney to add a mix of sweet and tangy flavours. Loaded with a flavourful mix of mashed potatoes, Aloo Kachoris are served with mango pickle, coriander chutney and sliced onions. Boiled potatoes are mixed with some spices and then rolled and stuffed into the wheat flour dough and which is then fried. In Uttar Pradesh, it is often known as the ‘Khasta Kachori’. Head to your nearest spot to try their heavenly kachoris that are best enjoyed in this weather with a hot cup of tea.